Posted May 13, 2018 . Filed under Alumni News, Events and Conferences, Research. Technology and Innovation in Hospitality. Posted May 10, 2018 . Filed under News. On Thursday 19th April the Institute of Hospitality Southern Branch held their 4th annual ‘Student of the Year Awards’ at the Balmer Lawn Hotel in the New Forest. The awards go to recognise outstanding student contribution in education to learning, development and professionalism within six award categories. 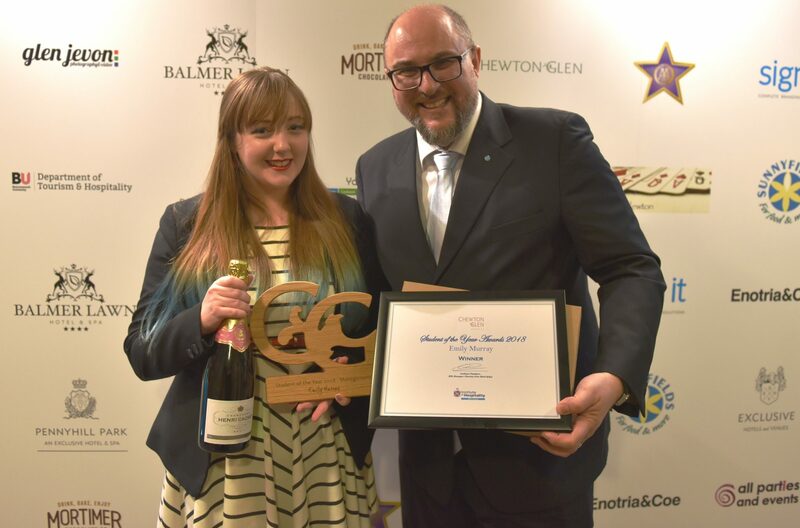 Bournemouth University International Hospitality Management student Emily Murray, who was nominated by her lecturer Dr Charalampos Giousmpasoglou, was recognised by the institute by being voted the winner in the category ‘Hospitality Management Student of the Year’. 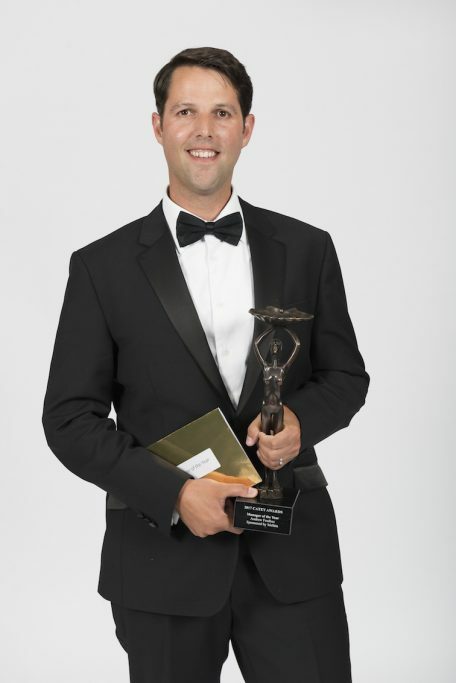 The award, sponsored by Chewton Glen Hotel and Spa, was presented on the night by Graham Chambers of Chewton Glen and Jane C Devonshire (Masterchef Winner 2016). Emily said ‘I am delighted to be recognised by the institute for the hard work and commitment I show to my studies at Bournemouth’. At the same glittering awards dinner Bournemouth University Senior Lecturer Crispin Farbrother received a commendation from the Institute as runner-up in the category ‘Inspirational Tutor of the Year’ (Commendation collected on his behalf by Dr Evangelia Marinakou). Crispin said ‘it was a pleasure just to be nominated for doing what I love and I am delighted to be runner-up in such a prestigious category with such fantastic competition’. 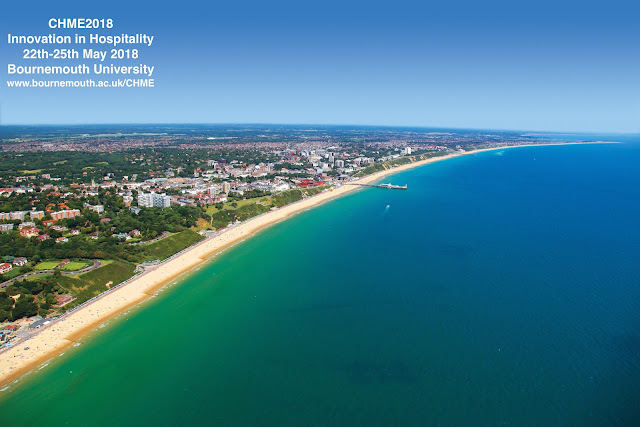 The Institute’s Chairman Richard Ward said, I was delighted by the strong showing from Bournemouth University in two of the award categories and look forward to more great entries in future years’. Head of Department Professor Dimitrios Buhalis also presented the Bournemouth University Department of Tourism & Hospitality Award in the category ‘Apprentice Student of the Year’ to Reegan Graff of Kingston Maurward College. Dimitrios said ‘ we are delighted to recognise the awesome talent within hospitality education and congratulate Reegan on being voted the winner’. Project is looking at the best practice of vegetable supply to address Brazil’s Food and Nutrition Security challenges of poor diet and sustainability. Posted April 29, 2018 . Filed under News. More than 22 Invited speakers from around the world, 60 research papers and posters, 30 PhD students and a comprehensive industry programme will facilitate great knowledge cocreation. Posted April 25, 2018 . Filed under News, Student Experience. European Tourism Destination (2012, 2014, 2017), and was nominated for three categories of the World Travel Awards: Best European Destination; Europe’s Best City Break; and Best Tourist Attraction. In this presentation, the key factors that contributed to the current success of Porto will be examined. In addition, the methodological steps and strategic approaches underpinning the design of Porto’s tourism Plan wwill be reviewed. The presentation will contribute to a better understanding of tourism planning at the regional level, since many of the points raised from Porto’s experience have a more general application to other cities experiencing growth in tourism or seeking to develop this sector. · Sub topic 4: The major challenges in the tourism destination to which the Strategic Plan must respond. Carla Pinto Cardoso holds a PhD in Economics of Tourism from Bournemouth University (UK) and is currently the Head of the Tourism and Heritage Department in the Faculty of Philosophy and Social Sciences at the Portuguese Catholic University (Braga Campus). Since 2015, she is also a senior tourism consultant at Sigma Team Consulting, where she was involved the design of the strategic plan for the Porto Tourism Board. Her research and publications interests include focus on tourism impacts and planning and strategic studies. Posted April 16, 2018 . Filed under Events and Conferences, News, Research. Posted April 10, 2018 . Filed under News. With a passion and broad knowledge of the luxury hotel business, Sal joined The Ritz in 2011 as Front of House Manager, before quickly progressing to Rooms Division Manager. He was appointed Hotel Manager in 2013 and General Manager in 2016. In his capacity as General Manager of The Ritz London, Mr Gowili continues to build on the hotel’s 110 years reputation and its legendary service, known as the byword for luxury and elegance, while maintaining its position amongst the great hotels of the world and at the forefront of the London hotel market. The Ritz enjoys one of London’s best locations overlooking The Royal Green Park. Mr Gowili oversees the hotel’s 136 rooms and suites, The Ritz Restaurant, The Palm Court, The Rivoli Bar and private dining rooms of the adjoining 18th century William Kent House, and manages a team of over 300 colleagues. Under his leadership The Ritz London has achieved outstanding revenue growth, whilst maintaining the very highest levels of guest service. 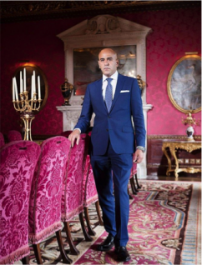 Prior to joining The Ritz, Sal obtained a degree in Chemical Engineering and spent 11 years in various management positions within Red Carnation Hotel Company, with his first management position in the 5* flagship property: The Milestone Hotel, after moving from Hilton Park Lane. Posted April 3, 2018 . Filed under Events and Conferences, Research, Student Experience. Please contact Dr Hanaa Osman or Professor Dimitrios Buhalis if you are interest in joining CHME2018 or those workshops. Posted April 2, 2018 . Filed under Alumni News. BU Alumnus Andrew Foulkes, is the new hotel general manager, Emily Estate and Hadspen House (currently under development) in Somerset.